Here at The Perfect Wedding Video, we like to tackle all the topics we can to provide soon-to-be brides and grooms with what they need to know leading up to their big day. With so many nuanced topics such as how to host a bridal shower, things can get confusing and stressful very quickly. Rest assured, we’ve done what we can to help clear up this topic for you! Bridal showers, which in many cases are akin to high tea with the Queen, got their start in the days when dowries still played a role in a woman’s married life. Normally, the bride’s family provided a dowry, but in the event where this wasn’t possible, then friends and some family members would throw a bridal shower. However, the bridal shower is more popular than ever. Tea is still sometimes served, though many a shower takes place in a local restaurant or country club. And while traditionally this has been counted as a “women-only” affair, modern men have been getting into the act, too. All of this adds to the fun of the shower, but with these new additions to the bridal shower traditions come some new guidelines. If you’re tasked with throwing a bridal shower for someone special in your life, then here are five tips to help keep things going smoothly as you and the bridal crew march toward that march down the aisle. Once upon a time, it was considered tacky for a family member to play hostess with the mostest at the bridal shower. Basically, this was akin to the family begging for cash and prizes for the bride, so to speak. That’s where the Maid of Honour comes in. In the old days, it was she who threw the bridal bash together, though some family members, like the bride’s mom were probably still involved. That depends on a couple of factors. Is it a more casual affair? Then, probably the host will pay for the whole party, which may be an afternoon tea in the backyard. Or is it more formal, with the expectation that everyone will wear proper ladies’ bonnets, dresses, and high heels? It might be better to get the bridal party and some of the family involved in that case. Bridal shower planners should be mindful of a few things, though. It’s important to remember that the parents of the couple – who should receive invites to this little soirée – already have a number of wedding obligations, including many financial ones. It might be good form to avoid asking them for money. Also, if the event is held at a place, like a day spa or a chic restaurant, it is usually expected that the guests will chip in and pay for things as well. The answer to this question should be determined before the event so that people aren’t confused about who pays for what once the bill comes. 3. Will the Bride Help to Plan the Bridal Shower? Probably. That’s the short answer, unless she is on the receiving end of a surprise, then she won’t know about it. If she does know about it, then she’ll probably have some input in the planning of it, especially if she has an idea for a theme. However, most of the day-to-day responsibility of planning it will fall on the host and whoever the host gets involved in said planning. 4. When Should the Shower Take Place? The bridal shower signifies the final run-up to the wedding. As such, it normally takes place two to five weeks before the wedding day. For destination weddings, it’s common for the bridal shower to be held even closer to the wedding: This allows out-of-town guests to come to the shower and then stay for the wedding without having to accrue more travel costs. As for the actual time of day, that varies. Afternoon parties, where snacks are served, tend to cost less. Formal dinners are rare, but not out of the question. Again, it depends on the theme, the guests, and any number of variables in the planning process. 5. Is the Bride Expected to Give the Host a Gift? A gift or a “thank-you” note or both is usually the protocol. It’s considered polite to thank the people involved in the planning. Do note as well that many couples have begun giving their guests wedding welcome bags. If the couple is going this route, then perhaps the wedding welcome bag for the bridal shower host can be a bit more elaborate and thought out. Nearly anyone who is on the wedding invite list should be fair game for the bridal shower. 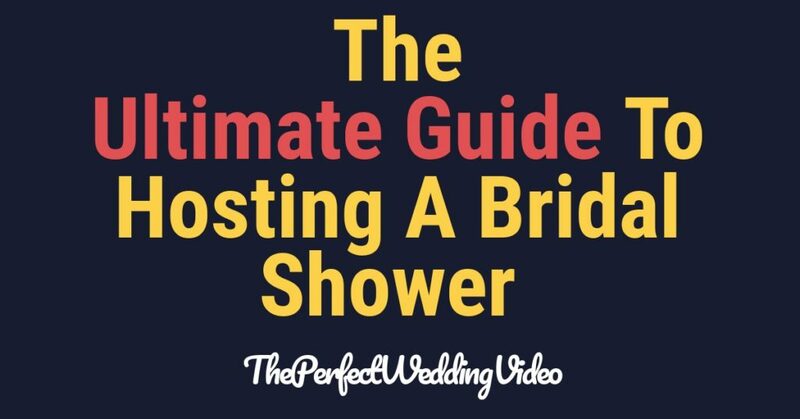 However, no one who isn’t already invited to the wedding should get an invitation to the shower. That said, the “who” of this has changed in recent years. It’s possible to be at a bridal shower and see men as guests. These parties have been dubbed “Jack and Jill parties” for this reason and have become quite popular as the roles of couples have changed with the times.